Brighten up anyone who is feeling a bit under the weather with this stuffed Feel Better Teddy Bear. 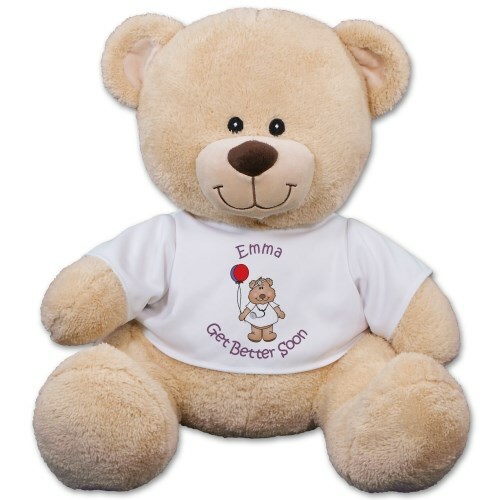 Sure to put a smile on anyone’s face, this personalized teddy bear makes the perfect get well gift idea. Free personalization of two line custom message is included to help you send unique get well wishes. The design is printed on a t-shirt worn by our favorite, Sherman Teddy Bear. Sherman is available in three different sizes. Choose from our 11 inch, 17 inch or our 21 inch teddy bear. Free gift wrapping and a free gift message are included to create a thoughtful presentation. It looked much larger online. It is 11 inches if you strech it out. This is the cutest Get Well Soon bear! My Aunt loved it! Additional Details If you know someone who is feeling a little blue, cheer them up and tell them get well soon with a Plush Get well Bear from 800Bear.com.